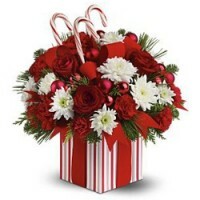 Sophisticated, elegantly, stylishly, this incredible bunch of flowers containing ten red roses, No w.. Cheer up someone, who means a lot to you, with these beautiful blooms. It is an exclusive Bunch of 1..
10 Orchids Bunch for Memorable Birthday. Beautifully wrapped in Pink color Paper Wrapping suits Eve.. This beautiful arrangement of Yellow and White lilies is just a perfect gift to someone who is near ..
Make your mother's day more special by gifting her this colourful bunch of 12 pink and red carnation.. This is one gift pack that you will definitely not want to miss.The pack contains a bunch of twenty .. Bunch of 20 carnations (10 red and 10 white) with green fillers in dual paper packing (red and white..
Happiness filled gift combo is bound to bring smiles on their face and make them feel cherished. So ..
You will cherish this lovely combo on special occasions like Birthday, Anniversary. This contains a ..